This is as interesting a spot as any in the parish, but it is rarely now called by this name, no doubt on account of its contiguity with Low Street. In days gone by some of the most fascinating, entertaining, highly amusing, and delightful scenes (deplorable ones, too) have been witnessed here, and to have seen the celebration of the annual carnival in honour of the patron saint of our old Parish Church within its prescincts this year would essentially take the minds of our older inhabitants back to the days of their youth! For was it not close by where Ovid Cope's "Cranky Horses" used to be placed, and which provided infinitely more fun to the juveniles in pushing them round to earn a ride than there is in the gilded cars and steam-horses of to-day! The Village Stocks once stood here with, no doubt, its sad sights, but with the Idle running in front of them quite a scene of Old English rural life was presented. The most noteworthy building which formerly stood here was the draper's shop, with residence, occupied for 50 years by the late Mr. W. Bonser—a more righteous soul than whom never lived. He took an active interest in the well-being of the parish as regards its spiritual, moral, and commercial aspects were concerned, and was one of the most highly-respected gentlemen then in the parish. De mortuis nil nisi bonum. No one can do any other than speak in the highest terms of the late Mr. W. Bonser. Chief amongst his domestic duties was the imparting to his offspring a sound and fundamental education, with the result that his sons Edward, Harold, George Gershom, and Arthur Howard have each been able to take up positions on our local governing bodies and discharge the duties thus devolved with conspicuous ability. The buildings of the Nottingham and Notts. Bank and Mr. S. J. Flood's now rear their tall, proud masonry on the old site, and they may be ranked amongst the best of the business establishments in the town. Where Messrs Crompton and Evans' Bank (which had its beginning in Sutton in 1873 on the premises of the Town Hall) now is was the late Mr. W. Buckland's chemistry business, latterly conducted by Mr. S. Peat there. A stackyard, with its accompanying utensils, and which was attached to the Robin Hood, at one time kept by the late Mr. M. Heathcote. used to be in the place of the Police Station, which was erected in 1861. The Denman's Head Hotel has also undergone several structural alterations from time to time. To revert to the late Mr. Bonser's premises, it may be added that Mr. George Jephson (brother of Dr. Jephson, of Leamington), resided there before Mr. Bonser, and before him Mr. Dodson, and his predecessor was Mr. Reason, at that time the property being occupied as two residences. The property was originally built as a warehouse, but when and by whom we do not know. The old brook ran in front of the end of the house, and years after on sunny afternoons lame Tommy (who had to proceed on his hands and knees, both protected by leather) might have been seen taking the air. In the New Cross district, was so "dedicated" in honour of Mr. Arthur Howard Bonser, J.P.,of Forest Lodge, Sutton, after whom a friendly society of the U.A.O.D., held at the Blue Bell Inn. Eastfield Side, was also named. Situated in the same district, were given their titles in memory of the late Rev. B. B. Slater, Vicar of S. Bartholomew's Church, Sheffield, who owned property in Sutton. In regard to this thoroughfare, it may almost be said to be a case of "Alpha and Omega," for whereas upwards of 40 years ago (1867) it was wont to be the most despised by the inhabitants, it is perhaps now the most frequented, and is of the greatest importance to the parish. At the period referred to, the road, we may be right in stating, was actually like a quagmire, and that pedestrians experienced the greatest difficulty in walking to and fro in that vicinity, stepping-stones having to be profusely used, whilst vehicular traffic was likewise conducted under extraordinary circumstances. Only those, probably, who saw the condition of things then can fully realise the contrast now! And, doubtless, all of us are grateful for the establishment—firstly, of the old Local Board; and. secondly, the Urban District Council, who now provide us with every comfort—good roads, pure water, illumination of streets, etc., etc. Of course, the ratepayers have to "pay the piper" for all our present day luxuries!!! The illustration here given depicts a scene at the mouth of the street, which was then called "Tenter Lane," from Forest Street. 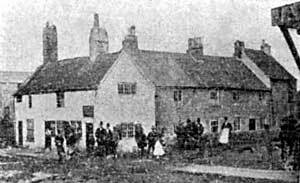 The cottages seen in the picture stood on the site of the Gas Works, whilst the works on the opposite side are those of Messrs. Jarvis, stone and monumental masons, etc., the site of which was previously used for garden purposes. The last tenants, prior to demolition, of the cottages were—Messrs. Jos. Scott, I. Wass, J. Jarvis, T. Gregory (whose son was stationmaster at Mansfield M.R. ), W. Crompton, and D. Dove. The whole of the land on the right and left of Outram Street was totally bare of buildings of any description up to 1869 when the builder first made a start of relieving the monotony of the landscape by erecting the New Cross Hotel for the late Mr. W. D. Adlington, of Skegby, at a cost of £400. In 1881, the late Mr. S. Soar, the then tenant, purchased the hotel from Mr. Adlington for the sum of £2,000, whilst on September 29th, 1897, the property passed into the hands of Messrs. Hole & Co., brewers of Newark, for an amount of £7,000. In 1870, Mr. H. Boot, of Forest Street erected the first two cottages in Outram Street (about 40 yards from the Great Northern Station), where he and a Mr. J. Cornish afterwards lived, and in 1880 the Midland Hosiery Company (since purchased by Messrs. I. and R. Morley) opened the hosiery fuctory (since greatly enlarged) in Penn Street. From that time building operations have progressed by leaps and bounds, and ere long, it is hoped, that the whole area which, 10 years or so ago was devoid of a cottage, will have received a visit at the hands of the builder. Outram Street is undoubtedly the best constructed in the parish, and is admirably supported by a number of well-laid out streets on either side. It is intersected by the Mansfield and District Light Railways, and with the innumerable business establishments it contains, and to witness the constant tread of humanity poured into it from its side veins, and from Stanton Hill, Skegby. Eastfield Side, etc., Sutton has every reason now to feel proud of the high position its once degraded channel has achieved! Outram Street bus, too. been the scene of many interesting cricket and football matches in connection with the Midland Hosiery, Sutton and Forest National, Sutton Zingari, and Sutton Town Cricket and Football Clubs, and it was not until 1903 that the latter's haunt was disturbed by a bold enterprise by a bold Sutton lady, who purchased the famous cricket and football ground and the adjoining land, and laid it out with the result as is now to be seen. Probably one drawback to the complete perfection of Outram Street may be that one of its corner-pieces is the Gas Works, but an improvement may be seen here in the near future. Now, those who have had an interest in the land in this most thriving part of the parish in days gone by, and at the present time, were and are—The late Mr. Edward Outram (whom the juveniles called "Nobby,"), the late Mr. James Bownes (Mansfield), the late Mr. S. D. Hibbert. the late Mr. Walter Straw, the late Mr. W. Parker, the Unwin Familv. the late Mr. W. D. Adlington, the late Mr. E. Hodgkinson (Kirkby Hardwick) Mr. W. J. Kirk, the Duke of Portland, Mrs Clarke, Messrs. Beeley, etc. As Mr. Outram was formerly one of the largest farmers and landowners in the neighbourhood of Outram Street, the old Local Board felt that it was only fitting that that street should be named after him. As mentioned elsewhere his farmstead was where the Rifleman Inn now is, and his stackyard used to go as far back as Parliament Street, running alongside that street, and at the rear of the New Inn, down to Forest Street, where, in the house now-occupied by Messrs. W, Burns and A Marriott, then lived his farm bailiff (the late Mr. Tom Gregory), and the late Mr. George Radford (the parish constable) also resided there at one time. The Outram Street district was at one time known as "Bull Field" on account, probably, of one of the fields in that neighbourhood being charged, under the will of the late Mr. John Newton (1681), for the maintenance of a parish bull (see page 1 7). Bowne Street gets its name from Mr. Bownes, and Penn Street from "Penn Close" (the field from which it is constructed). Portland, Bentinck, and Welbeck Streets were named to the honour of the Duke of Portland's Family, and Chatsworth Street to the Duke of Devonshire's Family. With the rapid growth of the Outram Street district, Forest Street may be regarded as the dividing line between the "Old Town" and the "New Town!" Standing on an elevated portion of the town, in Church Streets was built by the late Mr. George Oscroft, bag hosier, in 1853. Mr. Oscroft formerly lived on the premises now occupied by Messrs. Crompton and Evans' Bank in Low Street, whence he removed to Westfield. where he remained up to his death in 1861. The mansion has since been occupied by the late Revs. B B. Slater and C. H. Prance, the late Mrs. W. Sampson, Mr. John Boot. Mr. G. G. Bonser, Mr. J. G. Allsop, and now by Mr. J. Bagnold-Smith. In the reign of Richard I., Robin Hood, at the head of a band of freebooters, frequented the Sutton neighbourhood, and performed many wonderful exploits. "From playing field to the seat of industry," is our record in reference to Cursham Street, which was so called after the manner of a family of that name which resided at "Ashleigh House," High Pavement, where the late Messrs. Jesse Briggs and Robert Limb also once lived. The Rev. T. Cursham, who married a Miss Leeson, of Sutton, had an influential school here, the playing piece attached to which is now covered by Cursham Street. The rev. gentleman likewise acted as curate of Sutton for many years when there was no one in charge, and was also minister for Annesley. In fact, he took part in clerical work in most of the parishes in this district as occasion required. His son, Thomas Leeson Cursham, L.L.D., became Vicar of Mansfield. There used to be a stile at the top of Mount Street, and one near to the Hardwick Street Schools, with a footpath leading from one to the other, and the area all round was known as "Cursham's Croft." Cursham Street, which is practically in the heart of the town, is now one of our busiest thoroughfares, for within only a few yards of each other is to be found a kernel of our industries in Messrs. J. Briggs & Sons, Mr. H. W Cooke, and Mr. J. Pickard's hosiery factories. Morn, noon, and night much activity may be seen in this locality, something like 700 young men and women earning the "bread of life " within the walls of those buildings. Mr. J. Pickard. C. C., and Councillor J. Briggs, junr., can mostly be found in this street! Both John Street (New Cross) and Briggs' Street (Eastfield Side) were named after Mr. John Briggs, hosiery manufacturer, of Holme Side, Kirkby Road. The last-named street used to be called "The Bagdad." Mr. Briggs, who owns property in those streets, has officiated as parish warden for the past 27 years, and is now a member of the Mansfield Board of Guardians. He also served for many years on the old Local Board and Urban District Council, and in 1873 was a sidesman at the Parish Church, and at one time was an overseer of the Parish. For many years he has been a large employer of labour in the parish. The following is a list of the various Allotment Gardens in the parish, generously provided by the Duke of Portland. These allotments, with the exception of the "Jubilee," are charged for at the rate of Is. per 100 yards, the "Jubilee," which are cultivated by tradesmen, and which were provided in 1887, being charged for at the rate of 1s. 8d. per 100 yards:—Allwood's Croft 22, Allwood's (near) 37. Allwood's (far) 25, Burton's (near) 36, Burton's (far) 87, Willowbridge Lane 6. Carsic Lane 81/2, Allin's Croft 201/2. Chambers' Croft 28, Hucknall Lane (O.P.) 43, Forest Lane (near) 58, Forest Lane (far) 37, Forest Side Quarry 48. Reservoir 9, Forest Pingle 16, Brickyard 10 (Forest Side), Titchfield Park (Hucknall Lane) 84, Portland Park (Hardwick Lane) 119, Stable Piece (Forest Lane) 18, Jubilee (Hucknall Lane) 85. The figures indicate the number of gardens each lot contains. The local agent in respect to these allotments is Councillor C. H. Kitchen, Red House Eastfield Side. Many of the allotments contain comfortable arbours, and a number of wells have also been sunk in the gardens for a supply of water. The holders take a pride and pleasure in the cultivation and general order of their respective allotments. "THE OLD GIVES PLACE TO THE NEW." The old method - Mr H White. As Sutton has been from its early history, and to a very large extent still is, dependent upon the hosiery industry for the support of its inhabitants, we here give illustrations of the old method of the manufacture of stockings and the new method. It was in all probability in 1770 when the hand-frame was first introduced into the parish, and step by step the trade grew until it became the staple industry. Chief among the early bag hosiers, or employers of labour, were —Messrs. W. Chappell, S. Betts R. Tudsbury, T. Gadsby, J. Alvey, S. Hickton, Sml. Bower, E. Hickton, Jesse Briggs, W. Barnes, Geo. and C. Oscroft. C. Beastall, J. Radford, Jno. Briggs, and Nathan Aked, some of whom bought machinery from Messrs. Unwin at the time of the closing of their factory. The trade, unfortunately, was attended with varying success, and on many occasions the employees suffered hardships and inconveniences in regard to the payment of their wages, particularly before the extension of the Truck Act in 1887. Brighter days dawned, however, in 1880, when the Midland Hosiery Company introduced the first Cotton's patent (patented, 1864) into Sutton, and gradually the hand framework-knitting trade then began to diminish, until now comparatively few of the old hand frames are to be seen. Steam-power machinery, therefore, reigns supreme, and what Suttonian is not proud to behold the nine hosiery factories in our midst finding employment for some 1,500 of our young men and women, although the abolition of the old method of making hose has deprived a large number of old stockingers from earning a satisfactory livelihood at their trade! 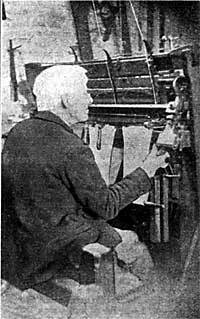 The inventor of the original hand frame was the Rev. W. Lee, M.A., of Calverton, in 1589. 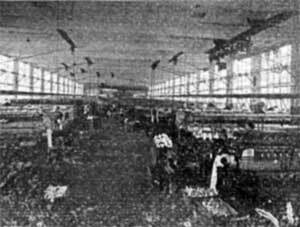 The new method —Interior of Penn Street Works. This, the residence of Dr. Mitchell, and which is situated in High Pavement, is also an interesting subject. It may have been built some 150 years ago by a man named Hall, who resided there, and who had a starch manufactory close by—hence the name of "Starch Yard" (page 44). Afterwords, a chandler named Barrett lived there, and later the house was enlarged to permit the late Mr. Wm. Handley, with his family of 11 grown-up sons, to take up their abode there. Those young men were all musicians, and in their workshop a brass musical instrument could be observed suspended from each of their stocking-frames. The house was put in its "single blessedness" again subsequently, and after Mr. George Oscroft (the painter-artist) had dwelt within its walls a short time, Mr. Nathan Aked (a bag hosier) bought it and then resided there. On account of a former owner, merely probably out of curiosity, having placed a "triumphal arch" over the portal from High Pavement, formed of the jaw-bone of a whale, the residence was designated "Jaw-bone House." This old relic of the sea-monster was removed by the late Mr. Charles Aked soon after his uncle had taken possession. Mr. Aked was followed by Mr. Samuel Miller (a retired gentleman hailing from the suburbs of Nottingham), and then it passed into the hands of Dr. Harding (who named it "Osman House," Osman being a family name), and who next passed it on to Mr. Charles Oscroft (bag hosier). Up to this period, there was nothing particularly attractive about the residence, so that the doctor commenced, and Mr. Oscroft completed, a scheme of improvement, with the result that it has now quite an "aristocratic" appearance. At the death of Mr. Oscroft on December 31st, 1887, his grandson (Charles Edmund) took up his residence there, but death taking him away on December 8th, 1892, at the early age of 27 years, left the house vacant for Dr. Banks, who likewise enjoyed but a brief sojourn within its portals. There is a noted well under the house, the water from which used to be sold to the inhabitants of Sutton. The house is now occupied by Dr. Mitchell, who, we are pleased to state, has just recovered from a serious and trying illness. The residence was bought a few years ago by the late Mr. William Palmer Adlington, of Newark, but a native of Sutton, who died June 10th, 1904, aged 34, for a sum of £1,300. It is said that at one time it might have been purchased for £400. From the many cherry trees which once abounded in the orchard at the rear of the house, it was termed "Cherry Holt,"—hence the name adopted by Mr. T. Shaw for his estate in King Street. In 1878, this Mission was opened in a very humble way in a cottage in Eastfield Side, but since then, with the rapid growth of the population in that part of the parish, considerable progress has been made, the Mission at the present time being a great influence for good. The first clergyman was the Rev. C. & Laing, who laboured in the Mission until 1881, the clergymen following being—Revs. F. W. Clarke 1881-1884, F. Welsh 1884-1885, W. J. Whitwell 1885-1886, J. W. Nesbitt 1887-1889, W. H. Williams 1880-1892, J. Winter 1893-1894, C. E. Leighton 1894-1903, P. Eykyn 1903-1905, C. H. N. Ivens 1905-1907, and E. C. Bartrum 1907. Premises formerly used by the Mansfield and Sutton Co-operative Society, situated in the brickyard and belonging to Mr. Aaron Barke, were used for several years as an Institute and for the holding of services on week-nights and Celebrations of Holy Communion, the Mansfield Road Infants' School being utilised as a Sunday school and for services. In 1887, the present Chancel, Organ Chamber, and Vestries were opened for Divine Service, the sacred edifice being dedicated by the Bishop of Southwell on S. Michael and All Angels' Day. The Chancel is in the Early English style of architecture, and is built of stone, the interior arches being of Ancaster stone. It will accommodate 300 people, services being held therein before the addition of the Iron Nave. The site of the building, which is in Outram Street, was purchased from the late Mr. Walter Straw for £2,000, and the cost of the edifice, so far as it is completed, is £1,520. This sum (£3,520) has been raised by voluntary subscriptions, with the exception of £470 bequeathed by a Mr. Billson. A special effort is now being made to raise the necessary sum to build the permanent Nave, the amount collected and promised towards that end being £784 7s. 11d. The Iron Nave was added and opened in 1890 by the Bishop of Derby, the Rev. W. H. Williams (now Vicar of North Muskham) then being in charge of the Mission. The cost was £400. An Institute, built of brick, and a large Iron Hall, have been erected at the rear, and the Mission is now in a healthy and prosperous condition. The Rev. E. C. Bartrum. of S. Paul's Church, Beckenham (Kent), commenced his duties September, 1907. Received its name from Mr. B. Walton, a hosiery manufacturer and large owner of property in that neighbourhood. This street was formerly known as "Waysty Lane," name which now dies hard with the older residents of the town. "Wallstone Place," off the same street, may have been so-called because of stone being quarried in the vicinity for building walls with, thus "wall-stone." Prior to the construction of the Town Midland Railway Station in 1893, the land at the rear of the Hardwick Street Council Schools was utilised as a recreation ground for the district of Hardwick Street, there being a footpath at the side leading from Hardwick Street into Forest Street. The ground is now occupied by the Midland Railway, the Lawn Tennis Club, and for garden purposes. The foot-bridge, spanning the railway from the schools to the side of Forest Lodge, was opened September, 1887. Two well-known Sutton residents in Mr. John Knowles Daubeny (for many years a Churchwarden and Chairman of the Duke of Portland's Allotment Committee) and Mr. Benjamin Oscroft, passed away in May and August, 1887, respectively. Since printing the matter on page 42, in respect to this building. Mr. R. Henstock, of New Street, kindly handed to us a copy of the old Nottingham Journal, bearing date Saturday, November 21st, 1801 (106 years ago), in which was published the appended advertisement:—"Capital Cotton Mill, Machinery, and Premises, situate at Sutton-in-Ashfield, in the County of Nottingham. To be sold by auction, by Mr. Gaskill (by order of the assignees of John Bacon, a Bankrupt), on the Premises, on Wednesday, the 10th of December next, at 12 o'clock in the forenoon, subject to such conditions as will then be produced:—Lot I: All that desirable and substantial Cotton Mill, in good condition, with about two Acres of Land adjoining, situate in Sutton-in-Ashfield aforesaid, and late in the occupation of the said John Bacon. Also, a Dwelling-house. Dye-house, and Bleaching-house, with the necessary Vatts, Coppers, Boilers, and Utensils belonging thereto. The Mill is worked by a capital Steam-Engine. on the principle of Bolton and Watts, of 16-horse power; and contains 816 Spindles in 11 frames, eight Mules of 156 Spindles each, with Carding, Drawing. Roving, und Twisting Machines. Reels, and every requisite for the Spinning business. N.B.—The Engine is calculated to work a much greater quantity of Machinery than is now worked, and for which there is convenient room in the Mill. Hands are plentiful, and the Mill may be set to work in a few days. Lot II: A small Tenement in the town of Sutton-in-Ashfield. and situated near the late Dwelling-house of Mr. Bacon. For any further information apply to Messrs. Evans and Middle-more, Solicitors, or Mr. Blatherwick, Nottingham; Mr. Jabez Unwin, Mansfield; or to Mr. Butcher, of Sutton-in-Ashfield, who will shew the Premises. Nottingham, November 17th, 1801." In the same publication appeared the public notice, taken from the previous Tuesday's Gazette, of Mr. Bacon's bankruptcy. It was as follows:—Certificates: December 5th: J. Bacon, Sutton-in-Ashfield, Notts., cotton-spinner. It will be noticed that the above somewhat supports the expressions made in our article. It would seem that over a century ago at least, that what is now commonly known as "The Old Malt-house," was the centre of industry. Would that it were so to-day, instead of the building now standing practically in a disused state, for a renewal even of the old industry within its walls would be a welcome asset to the parish at the present time! Also, in the same newspaper (which was published at 6d., and which bears a Government Stamp) the following paragraph appears (see page 51): — ''On Tuesday evening last, the young gentlemen at the Rev. T. Cursham's boarding-school, at Sutton-in-Ashfield, performed several pieces from Shakespeare, and other Authors, before a very numerous auditory. The selection of the Pieces, and the very easy manner in which they were delivered, gave great satisfaction to all present, and much credit both to the tutors and their pupils." Off Hardwick Lane, owes its appellation to Dr. Nesbitt, J.P., the Medical Officer of Health of the Sutton Parish, who resides in High Pavement. New Cross, Was thus christened after Mr. Thomas Beighton, a native of Huthwaite, formerly of Stanton Hill, and now of Sutton, who owns some of the property there. Sutton-in-Ashfield was not behindhand in the matter of commemorating the late Queen Victoria's Jubilee in 1887 (50 years reign). On the morning of June 21st, upwards of 2,000 children were marshalled on Portland Square, where the National Anthem was sung by the vast assembly. Thence the children proceeded to the Lammas Eecreation Ground, where a new penny and a bun were given to each child. All the old people above 60 years of age were entertained in the afternoon to a good Old English dinner, consisting of roast beef, plum pudding, and beer. A sheep was roasted whole in the Brick and Tile Inn yard, and this was given away to those who chose to partake. In the evening a beacon fire was lit on Coxmoor —the highest eminence in Nottinghamshire. The pile was 14ft. in height, and was composed of wood, gorse, and tar. Many hundreds of people witnessed the lighting of this fire, which took place at 10 o'clock, and burned several hours. A large number of the Derbyshire beacon fires were discernible from this eminence. Illuminations were also provided from the Gas Works and other places, whilst flags were profusely displayed from tradesmen's establishments and other buildings, and the day generally was spent in a loyal and hearty manner. Is situate in the most important part of the parish, viz., in the Market Place, between Miller and Co.'s and the Mansfield and Sutton Co-operative Society's premises. Its insignificance is in all probability due to the fact that it has no public outlet, and, therefore, cannot be used for public traffic, it being the only "ways and means" to reach the several cottage homes therein. Its history, however, will be interesting, for the name it hears was probably about 140 years ago the most honoured in the parish, and a name that is still revered. Where Mr. William and Elizabeth Butcher (after whom the yard is called) came from to Sutton about the time mentioned we are unable to state, but in this much we are certain that they were a family of opulence, and that, by their generous benefactions to the inhabitants, became an influential and honoured family in the town. Their drapery business was the leading one of its kind in the whole neighbourhood. and it is believed, too, that they built all the property which once stood from Miller and Cos premises on to Wood Street, and also owned the then extensive orchard at the rear. The changes which have been effected here from time to time have been remarkable, but the most drastic was in 1887 (the late Queen Victoria's Jubilee year), when Victoria Street was constructed right through the centre of the orchard, and now in place of the many tall trees which formerly abounded there (and which were planted by the late Mr. Richard Buckland) is to be seen some of the smartest buildings in the parish, notably, the Congregational Church. The orchard used to be enclosed by a high and substantial wall along New Street, High Pavement, and Wood Street, and a portion of the ground was set apart as a bowling green. The late Mr. Samuel Shepherd, the proprietor of the Red, White, and Blue Inn before it was brought up to its up-to-date style, becoming ihe tenant of the Orchard, and being an intimate acquaintance of the late Mr. Butcher, it subseouently was known as "Shepherd's Orchard.'' The houses at the top of the Market Place had pleasant gardens joining on to it, the one occupied by Mr. G. Coombe being now the only one left. William Butcher died January 12th, 1832, aged 65, and his wife (Elizabeth) on December 17th, 1818, aged 50. It is said that the former died suddenly near to Westfield House, either on his way to the Parish Church to be present at his daughter's wedding, or on his return. (They did not ride in carriages to Church in those days!) Needless to state, his sudden demise cast quite a gloom over the town, deceased having been held in high esteem by the inhabitants. Several members of the family are buried in Sutton churchyard, the last to be buried there being Mr. Herbert Butcher, who died May 1st, 1878, aged 71. He lived for a number of years with the late Mr. and Mrs. Wm. Buckland in Wood Street. Descendants of the family are now to be found at Kidderminster. The Butcher property in the Market Place was probably more of a business centre a century or so ago than even it is to-day, and there are several alive now who can well remember the late Mr. Matthew Dodson (grocer), Mr. Robert Judd (draper), Mr. R. Littlewood (chemist). Dr. S. T. Hall, and Dr. Valentine living there, and subsequently Mr. George Oscroft, Mr. J. Haslam, Mr. George Allsop, Mr. Ben Butterworth, Mr. H. S. Charlton, Mr. F. W. Buck, Mr. R. Charlton, and finally Messrs. F. C. Smith and H. A. Smith, bankers, Nottingham (who became the purchasers of a large portion of the estate), and Messrs. Miller and Co. The Parochial Offices also used to be attached to this block of buildings. Over 60 years ago the Sunday School scholars "walked round" the beautiful gardens in the Orchard each year at Whitsuntide.